Indication: CLOBEX® Spray 0.05% is indicated for the topical treatment of moderate to severe plaque psoriasis affecting up to 20% body surface area in adults 18 years of age or older. Adverse Events: In controlled clinical studies, the most common adverse reactions (> 2%) were burning, pruritus, nasopharyngitis and upper respiratory tract infection. Local adverse reactions may occur more frequently with the use of occlusive dressings. Warnings/Precautions: Clobetasol propionate has been shown to suppress the HPA axis at the lowest doses tested. Treatment should be limited to 4 weeks. The total dosage should not exceed 50 g (59 mL or 2 fl oz) per week. Do not use more than 26 sprays for each application or more than 52 sprays in 1 day. Below is a list of dermatologists in your area. Print your list, or for savings check out Clobex Spray Support Pack. If you have psoriasis, you’re not alone. 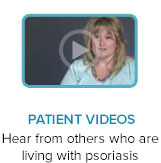 These videos will give you some insight into what others who have it are thinking and feeling, and how they’re coping with psoriasis every day. With the online savings program, you may be eligible to pay a $0 copay for Clobex® Spray in 2.0 fl oz and 4.25 fl oz bottles. This offer is also good for refills. Maximum savings on 2.0 fl oz bottles is $125. Maximum savings on 4.25 fl oz bottles is $250. You must present a valid prescription to your pharmacist along with your card. Payment will be dependent upon actual insurance coverage. Note: Cash payers are not eligible for this program. THIS OFFER IS AVAILABLE FOR A LIMITED TIME ONLY AND GALDERMA LABORATORIES RESERVES THE RIGHT TO RESCIND, REVOKE, AMEND, OR TERMINATE THIS OFFER AT ANY TIME WITHOUT NOTICE. The website you are about to view is not intended for consumers. It is for U.S. healthcare professionals only. After certifying that you are a U.S. healthcare professional below, you will be taken to product information intended for HCPs. To the Patient: This offer is for insured patients only. You MAY pay $0 for your prescription. You must present this card to the pharmacist along with your prescription to participate in this program. You are not eligible if prescriptions are paid by any state or other federally funded programs, including, but not limited to Medicare or Medicaid, Medigap, VA, DOD or Tri-Care, or where prohibited by law. Your actual payment will be dependent upon your insurance coverage. Maximum benefits may apply. For complete terms and conditions visit www.clobex.com. THIS OFFER IS AVAILABLE FOR A LIMITED TIME ONLY AND GALDERMA LABORATORIES RESERVES THE RIGHT TO RESCIND, REVOKE, AMEND OR TERMINATE THIS OFFER AT ANY TIME WITHOUT NOTICE. Indication: CLOBEX® Spray 0.05% is indicated for the topical treatment of moderate to severe plaque psoriasis affecting up to 20% body surface area in adults 18 years of age or older. Adverse Events: In controlled clinical studies, the most common adverse reactions (> 2%) were burning, pruritus, nasopharyngitis and upper respiratory tract infection. Local adverse reactions may occur more frequently with the use of occlusive dressings. Warnings/Precautions: Clobetasol propionate has been shown to suppress the HPA axis at the lowest doses tested. Treatment should be limited to 4 weeks. The total dosage should not exceed 50 g (59 mL or 2 fl oz) per week. Do not use more than 26 sprays for each application or more than 52 sprays in 1 day. If you have psoriasis, you’re not alone. Up to 7.5 million Americans are living with it every day. Plaque psoriasis is the most common form. It’s characterized by raised patches of red skin, covered by white flaky buildup of dead skin. It can appear anywhere on the body, but most commonly is found on the knees, elbows, torso, and scalp. In fact, half of all people with psoriasis have it on their scalp. Quality of life can be negatively impacted. Many patients have feelings of helplessness, anger, frustration, depression, low self-esteem, embarrassment, and self-consciousness — often leading patients to miss out on life’s little pleasures like going to the beach, wearing shorts, or putting their hair up. Psoriasis can also affect daily life, making it difficult for patients to do normal activities such as sleep, walk, use their hands, and even sit or stand for long periods of time. And studies have shown that people with psoriasis miss more than 55 million hours of work every year. The National Psoriasis Foundation continues to survey patients and they have found that of those who participated in the survey, 74% who reported missing work in the last month did so in order to receive treatment. While psoriasis is not contagious, it is a chronic condition for which there is no cure yet. However, it’s manageable and controllable. The key is finding the right treatment for you and your lifestyle. Find out how Clobex® (clobetasol propionate) Spray, 0.05%, can work for you. To better understand important psoriasis terms and definitions, please refer to the glossary below. Clobetasol Generic name for a steroid medication often used to treat psoriasis and other skin conditions like eczema, atopic dermatitis, etc. Clobex® Brand name for steroid medication clobetasol propionate 0.05%, an FDA-approved treatment for moderate to severe plaque psoriasis. Dermatoses General term for any skin abnormality or the appearance of lesions on the skin. Erythema Skin redness and inflammation. Nasopharyngitis Inflammation of the nose and pharynx. plaque psoriasis The most common type of psoriasis, a disorder in which skin grows and replaces itself too rapidly, causing a buildup of red, thickened areas (plaques) covered with silvery scales. Pruritus Localized or generalized itching due to irritation of sensory nerve endings. Scale A layer of dry skin that appears to be peeling in large flakes. When caused by psoriasis, it is the result of dead skin cells piling up on the skin's surface. Have you been avoiding some of life’s little pleasures — like going to the beach, wearing shorts, or even putting up your hair — because you’re embarrassed or self-conscious about your moderate to severe plaque psoriasis? Maybe it's time you looked at Clobex® (clobetasol propionate) Spray, 0.05%, with its easy-to-use, innovative spray nozzle delivery system to target your problem area. Learn how to use Clobex® Spray. 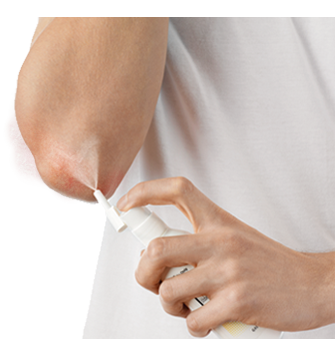 Clobex® Spray offers effective relief for the itching, flaking, and scaling of moderate to severe plaque psoriasis. Its potent formulation helps slow down the overactive immune response that causes these symptoms. Plus, it shrinks the skin’s blood vessels, helping to soothe the redness that’s often seen with psoriasis. Clobex® Spray is a topical corticosteroid used to treat moderate to severe plaque psoriasis in people 18 years of age or older for up to 4 weeks. Clobex® Spray was studied in 5 different clinical trials, on more than 2000 patients. In one trial, Clobex® Spray was proven effective in treating body plaque psoriasis. In a study of 2488 patients, 80% were clear or almost clear in 4 weeks. See the results for yourself. Clobex® Spray has also been proven effective in treating scalp plaque psoriasis. In a study of 81 patients with scalp psoriasis, 85% were clear or almost clear in 4 weeks. See the results for yourself. Find out from your dermatologist if Clobex® Spray is right for you. Don’t have a dermatologist? Find one in your area. The most commonly reported side effects were burning, itching, inflammation of the nose and pharynx, and upper respiratory tract infection. See for yourself. Below are pictures of patients before treating their body plaque psoriasis or scalp plaque psoriasis with Clobex® (clobetasol propionate) Spray, 0.05%, and at 2 and/or 4 weeks of therapy. Individual results may vary. In a plaque psoriasis study, 80% of patients were clear or almost clear at 4 weeks. From a 4-week, open-label, multicenter study evaluating efficacy (1985 patients) and safety (2342 patients) of Clobex® Spray as monotherapy or add-on therapy. Koo YM. Cutis. 2007;80(suppl 5):4-11. In a body plaque psoriasis study, 30% more patients were clear or almost clear with Clobex® Spray, 0.05%, than with a leading topical ointment. From a 4-week, randomized study comparing efficacy, safety, quality of life, and patient satisfaction with Clobex® Spray twice a day vs Taclonex® Ointment once a day in patients with moderate to severe plaque psoriasis. Dosing was according to approved labeling for each product. The treatments showed similar disease improvement when measured by researchers using the Investigator Global Assessment (IGA) of the affected body surface area. IGA success rates were defined as mild and clear. Both treatments were generally well tolerated, with more patients reporting mild stinging/burning with Clobex® Spray. In a scalp plaque psoriasis study, 85% of patients were clear or almost clear at week 4 (end of treatment). A 4-week, multicenter, randomized, double-blinded, vehicle-controlled study assessing the treatment of moderate to severe plaque psoriasis of the scalp with Clobex® Spray or vehicle spray. 81 patients participated in the study. Treatment-related adverse events reported with use of Clobex® Spray on the scalp included moderate burning sensation and alopecia. Sofen MD, et al. J Drugs Dermatol. 2011;10(8):885-892. * From 2 randomized, vehicle-controlled clinical trials that were identically designed to assess efficacy and safety of Clobex Spray, 0.05% (n=120 or vehicle spray (n=120) in patients with moderate to severe plaque psoriasis for up to 4 weeks. Patients were evaluated on their ODS. Average values from the 2 studies are shown. More than 1500 patients who have used Clobex® (clobetasol propionate) Spray, 0.05%, participated in a survey. These patient survey results are reported in the VOICES Program. * See for yourself what they said about their experience. Individual results may vary. * The VOICES Program is a community-based outcomes survey. As of July 9, 2012, 1676 patients have enrolled in the VOICES program. Patients scored their psoriasis improvement on a scale of 1 to 9, with 1 being defined as “not at all improved” and 9 being defined as “very improved.” Ratings of 7 to 9 were defined as “high improvement.” Patients in the program receive a copay card and a gift card for their participation. Talk to your dermatologist today. Ask if Clobex® Spray is right for you. Don’t have a dermatologist? Find one in your area. Clobex® Spray is formulated so that it can easily and quickly dissolve into the scalp and body. And the nozzle on the Clobex® Spray bottle is specifically designed to help patients apply treatment exactly where it’s needed, with precision. 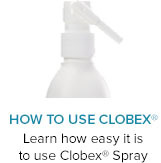 In a recent survey, 77% of patients reported that the directional nozzle made Clobex® Spray easy to apply. Apply Clobex® Spray twice a day; use only enough to cover the affected areas. Rub in gently. Before using Clobex® Spray, tell your doctor about all other medicines you are taking, if you have a skin infection, or plan to have surgery. Also tell your doctor if you are pregnant, plan to become pregnant, or are nursing (it is not known whether Clobex® Spray can harm your unborn child or passes into your milk). Half of all people with psoriasis have it on their scalp. And just like psoriasis on the body, it can be mild, moderate, or severe with plaques covering the entire scalp. It can even extend onto the forehead, back of the neck, and around the ears. To apply Clobex® Spray to the scalp, part the hair and spray directly onto the affected area. For the best delivery, keep the bottle in an upright position. Plaque psoriasis can occur anywhere on the skin including palms, soles of feet, fingernails, toenails, and face. But some of the more common areas are the knees, elbows, back, and scalp. Clobex® Spray can cover large areas of the body like these. To apply Clobex® Spray to the body, direct the nozzle toward the affected area, spray only enough to cover the area, and rub gently to ensure even coverage. Note: Do not apply Clobex® Spray to your face, underarms, or groin, and avoid contact with eyes and lips. Stay focused on your overall health. It can help you stay in control of your psoriasis. When cleansing your skin, don’t rub too hard; this will irritate it. Rinse with lukewarm water and pat your skin to dry it. A gentle cleanser like Cetaphil® Gentle Skin Cleanser is nonirritating and rinses off easily. 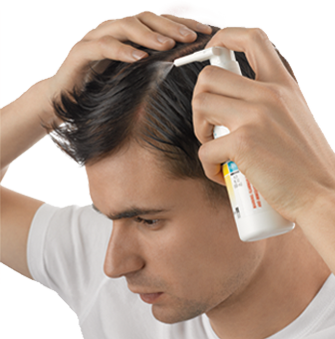 If you have scalp psoriasis, use conditioner after you shampoo to moisturize your scalp. Then rinse with cold water. Apply moisturizers during the day and heavier lotions or creams at night, especially in dry weather. Cetaphil® Moisturizing Lotion and Cream are gentle, fragrance-free options. Apply a cold compress to itchy areas. A warm oatmeal bath may also help relieve itchiness. Avoid hot water. Use only warm water on your skin. Wear cotton clothing. Soft cotton is light and less irritating to your skin than other fabrics. Don’t smoke. Research suggests that smoking can trigger psoriasis. Avoid using a nicotine patch to help you quit — it can also trigger psoriasis. Use sunscreen every day. Sunburns are a known trigger for psoriasis. Limit alcohol intake. Heavy drinking may trigger psoriasis and even prevent treatment from being effective. Reduce stress. Many people with psoriasis experience flare-ups during stressful times. Yoga, meditation, and other relaxation techniques can be effective. Don’t isolate yourself. Talk with friends and family to build a support system or join a local support group. Change your focus with Clobex® Spray today. In addition to a prescription savings card, you'll receive a dermatologist finder, skin care guide, and doctor discussion guide. You can download all of these as a single PDF below. If you don't want something, just unclick it. Most patients pay a $0 copay each time they fill their prescription for Clobex® Spray. Certain limitations may apply. * Read program details. Get a list of dermatologists in your area. 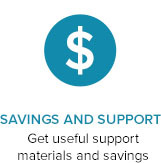 Just enter your zip code in the box before downloading the support pack. Important health care tips and information for people with psoriasis. Use this valuable worksheet to help you prepare for your next doctor’s appointment. * Void where prohibited by law, taxed or restricted. You are not eligible if prescriptions are paid by any state or other federally funded programs, including, but not limited to Medicare or Medicaid, Medigap, VA, DOD or TriCare, or where prohibited by law. Please refer to eligibility requirements in the Terms and Conditions. THIS OFFER IS AVAILABLE FOR A LIMITED TIME ONLY AND GALDERMA LABORATORIES RESERVES THE RIGHT TO RESCIND, REVOKE, AMEND, OR TERMINATE THIS OFFER AT ANY TIME WITHOUT NOTICE. Just a minute! You forgot to sign up for the Clobex® Prescription Savings Card, which provides savings on each Clobex® Spray refill to eligible patients. Go back to Savings and Support. Please note: PDF files may take up to a minute to download and open. For more information about psoriasis visit the National Psoriasis Foundation. Clobex® (clobetasol propionate) Lotion, 0.05%, is not recommended for anyone younger than 18 years of age. Clobex® Lotion is indicated to treat steroid-responsive dermatoses. Treatment of steroid responsive dermatoses (eczema, dermatitis) should be limited to 2 weeks. Use only as directed by your physician, and do not apply to your face, underarms, or groin and avoid contact with your eyes and lips. The total dosage should not exceed 50 g (50 mL or 1.75 fl oz) per week. You should use Clobex® Lotion only for the minimum period necessary to achieve desired results. In clinical trials, patients reported burning/stinging, skin dryness, irritation, redness, itching, skin thinning and widening of blood vessels. Because too much Lotion passing through your skin may affect your adrenal glands, do not use more than prescribed and stop using the product if you experience nausea, vomiting, fever or low blood pressure, and call you doctor. If you are pregnant, trying to get pregnant or nursing, speak to your doctor before using Clobex® Lotion. Clobex® (clobetasol propionate) Shampoo, 0.05%, is not recommended for anyone younger than 18 years of age. Clobex® Shampoo is indicated for the treatment of moderate to severe scalp psoriasis. Treatment should be limited to 4 weeks. Do not use more than 50 g (50 mL or 1.75 fl oz) per week. Use Clobex® Shampoo only for the minimum period necessary to achieve desired results. Use only as directed by your physician, and do not apply to your face, underarms, or groin and avoid contact with your eyes and lips. Adverse events reported during use of Clobex® Shampoo include application site burning/stinging, hair loss, itching, swelling, infections, acne, dry skin, application site irritation, skin thinning and widening of blood vessels. Because too much Shampoo passing through your skin may affect your adrenal glands, do not use more than prescribed and stop using the product if you experience nausea, vomiting, fever or low blood pressure, and call you doctor. If you are pregnant, trying to become pregnant or nursing, speak to your doctor before using Clobex® Shampoo. ©2014 Galderma Laboratories, L.P. United States, All Rights Reserved. All trademarks are the property of their respective owners. This site intended for U.S. audiences only. Information in this website is not intended as medical advice. Talk to your doctor about medical concerns.